Sting had a long face this week that got him attention on social media. 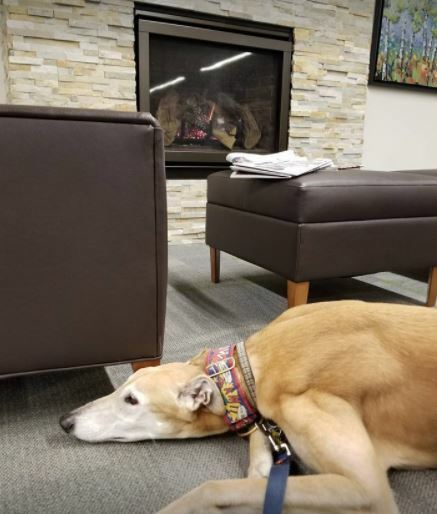 But, his owner points out, the 10-year-old greyhound always has a long face — he can’t help it! 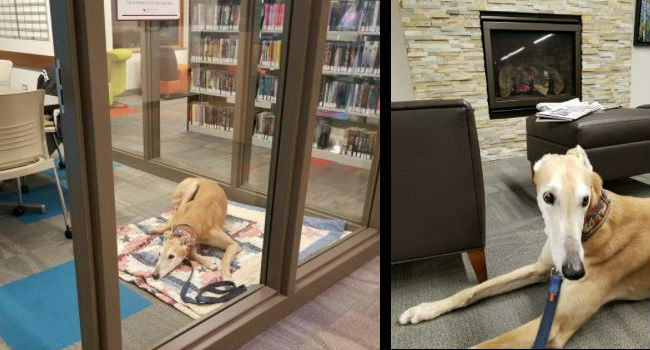 Sting was on a visit to the Ramsey County Library in White Bear Lake, MN, a twice-weekly stop for the retired racer that’s part of the library’s Paws to Read program, which encourages literacy by inviting young children to come in and read to dogs. It’s been a regular gig for a couple of years. But this week, for whatever reason, no one showed up, and Sting’s owner, John Muellner, posted about it on Facebook. Since then, the library’s phone hasn’t stopped ringing. And it’s all because of Sting’s lovely “sad” face. The dog is booked through April, as are the other therapy dogs who participate in the reading program. Sting’s participation lasts about an hour. Three children sign up; each reads to him for 20 minutes. Muellner, 56, says Sting’s “easygoing” nature is ideal for a therapy dog. In fact, Sting works at a local children’s hospital, as well. 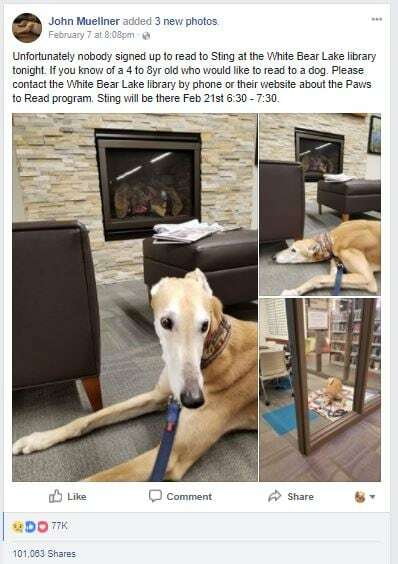 That said, Muellner assured TODAY that Sting wasn’t really upset that no one showed at the library. The “sad” face that made him go viral is just that: his face. Lovely Lilla’s Been Waiting A YEAR For Her Forever Home. Bring Her Home For Her Next Birthday! 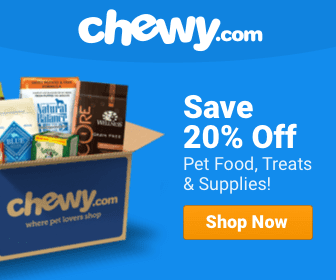 Love the dog. Have 3 of my own. Hope the program keeps going. Good boy, sting.